Mini Muffin Fruit Kabobs With White Chocolate Dip! Do your kids arrive home with an appetite after school? If so, these Mini Muffin Fruit Kabobs With White Chocolate Dip would be a yummy way to help hold them over until dinner time. Coupons for product redemption, information, and gift card have been provided by Entenmann’s® Little Bites® so that I could try the product and share my thoughts and information about Entenmann’s® Little Bites®. The opinions expressed in this post are my own and do not reflect the opinions of Entenmann’s® Little Bites®. Entenmann’s® Little Bites® have been a time saver on many occasion for me. Whether needing a quick breakfast before church, an addition to my kiddos lunch boxes, or an afternoon snack, these delicious little muffins have been a long time favorite of my family. Recently, I was given an opportunity to sample the seasonal favorite of Entenmann’s® Little Bites® Strawberry Yogurt Muffins and immediately was inspired to put together a fun Fruit Kabob. Read on to see how I not only created an after school treat for my kiddos, but also made an easy White Chocolate Dip to go alongside it. Little Bites® Strawberry Yogurt Muffins are made with real strawberries and come in portioned pouches ideal for breakfast or snacking on-the-go. These muffins feature a blend of fruit and creamy yogurt that all 3 of my kids can appreciate. 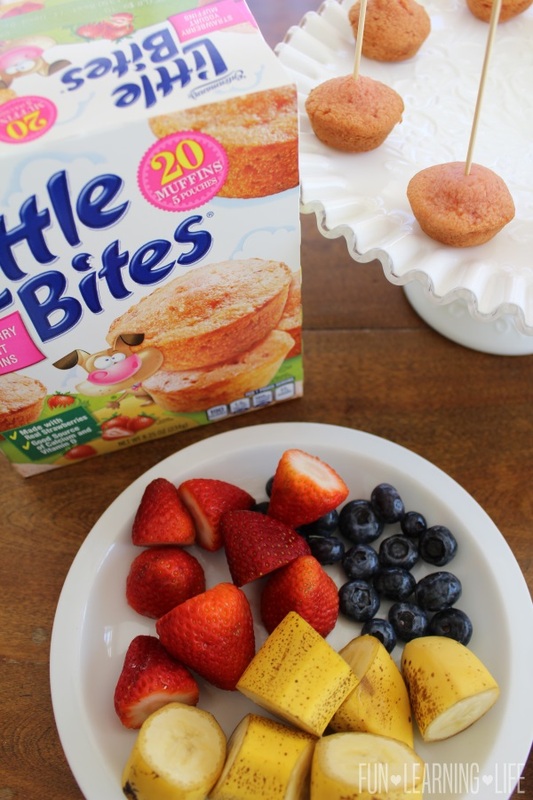 With less than 200 calories per pouch, Entenmann’s® Little Bites® Strawberry Yogurt Muffins are a good source of calcium and vitamin D, and never contain high fructose corn syrup or trans-fat. 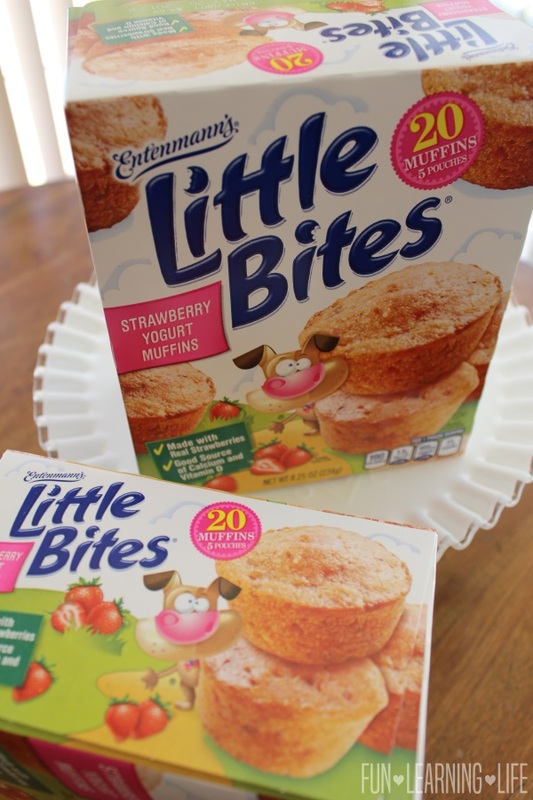 For more information about Entenmann’s® Little Bites® Strawberry Yogurt Muffins please visit www.littlebites.com. See how I assembled them alongside an easy fruit dip below! To get started, melt the chocolate squares in the microwave. I put mine in a microwave safe glass bowl and heated it for 30 seconds. I then stirred until the chocolate was completely melted. 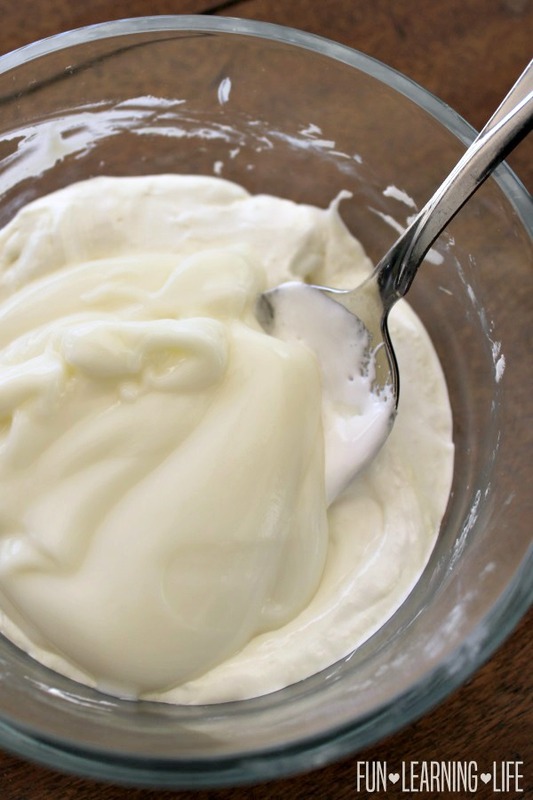 Next, add the marshmallow fluff and stir (it will almost form a dough), then add the vanilla yogurt and stir for about 2 minutes until completely combined. I then covered the bowl and placed this into the fridge to chill. To assemble the fruit kabobs, first take a package of Entenmann’s® Little Bites® Strawberry Yogurt Muffins and place one of each on a mini skewer (4 inch). Then slide your choice of 2 -3 pieces of fruit on top. Tip: Cut the pointy ends off of the skewers before you assemble the kabobs to avoid kiddos getting poked. We used Strawberries, Blueberries, and Bananas in our Fruit Kabobs. To finish, simply add these to a dish with the White Chocolate Dip and serve immediately. I refrigerated the left over dip and will be making these again tomorrow, the kids loved it! Have you tried Entenmann’s® Little Bites® ? Which local grocer would you shop at to purchase Entenmann’s® products in your area? To learn more about Entenmann’s® Little Bites® visit their website as well as Entenmann’s® Little Bites® on Facebook, Instagram, and YouTube. Not only would this recipe be great for everyday but would also be fun for a birthday celebration, baby shower, or tea party. 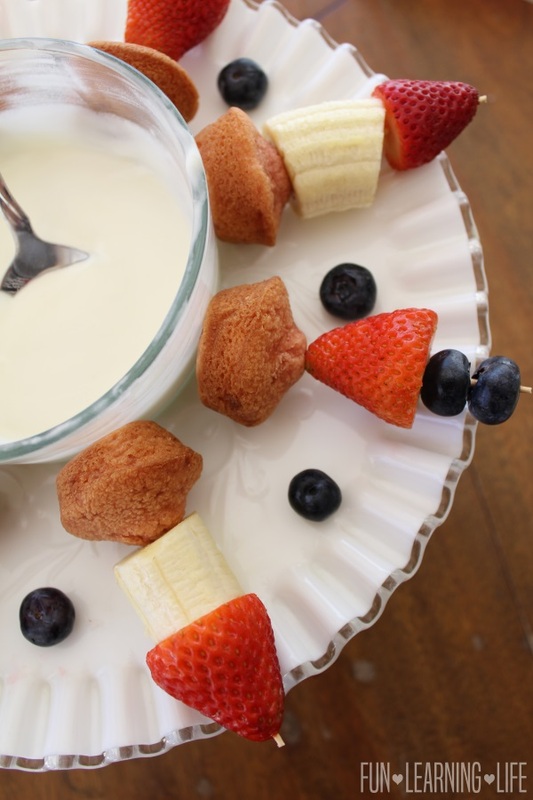 I hope your family also enjoys these Mini Muffin Fruit Kabobs With White Chocolate Dip! * Participates must be 18 years or older to participate and live in the United States. Odds are based on the number of entries, and by participating, you agree to these terms and the laws set forth by your individual state. Entries will only be accepted through the Rafflecopter Form, and Fun Learning Life is not responsible for disruption of the page or service which could cause problems with entering. The winner will be contacted through email (make sure you check your spam or junk mail) with the Subject line “Little Bites Pack Winner”. Shipping information, including email, phone, and address will be collected at that time. The winner has 48 hours to respond, after that an alternate will be chosen, and so on and so forth. Fun Learning Life does not sell personal information. The prize will be fulfilled by the PR Firm. Fun Learning Life does not share information with 3rd parties unless specifically expressed in a specific promotion or giveaway. This giveaway is not associated, nor sponsored by Facebook. 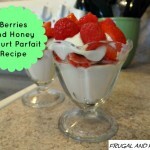 Berries and Honey Yogurt Parfait Recipe! Plus, Celebrating National Breakfast Month With A Driscoll’s Berries Giveaway! We love Entenmann’s Little Bites. I usually buy them at Walmart. I will have to try the strawberry yogurt ones. I have tried the Little Bites before. My kids and I like the Blueberry Muffin Little Bites. I have not tried them before. I would purchase them from Dillons. We Entenmann’s Little Bites blueberry muffins and usually purchase Entenmann’s products at Target. Yes I've tried them. .We purchase them from Woodmans. My family likes the Entenmann’s Little Bites Fudge Brownies. I'd love to try the Strawberry Yogurt Muffins. I buy them at Shop Rite. Thank you! We enjoy Entenmann’s Little Bites. We purchase them at Woodmans. I eat little bites all the time. They are perfect to eat while I am driving to work. I shop at our local IGA. Not that I have much of a choice the next nearest store is 1/2 hour away. we love the chocolate chip! Yes, we eat Entenmann's Little Bites muffins on a regular basis! We usually shop at Publix or BJ's for them. We love the Chocolate Chip and Blueberry flavors! I have tried the Entenmann's Little bites and they are so good. I would get these at Walmart. They sell a lot of different flavors. I like the chocolate chip Little Bites. I would buy them at Target. I would shop at Food Lion or Lowes Foods. I've tried little bites and love them. The snickerdoodle flavor is great! I have tried Entenmann’s Little Bites, in fact, with four kiddos, they are a staple in my home! I always buy them from my local Shoprite! Yes, I have tried Little Bites. I would shop at Price Chopper. I have not tried these. I would shop for them at Schnucks or Walmart. I have tried the little bites and we love them. I buy them at my local Winn Dixie all the time. Little Bites have become a staple in our pantry. We usually buy them at Walmart or Target. My nephews love Little Bites, especially the brownie flavor. Right now, we have the strawberry yogurt, which they really like. We usually pick them up at Walmart. I haven't tried them, but I've seen them at Safeway. Yes, I've tried Entenmann’s Little Bites. We usually buy them at Kroger. I love these. we did fruit kabobs with Entenmann's Little Bites Brownies for my daughter in laws baby shower. They were a big hit with children and adults alike. I would purchase them at Walmart. My family loves Little Bites! We buy the blueberry flavor at SuperTarget. I have tried them. I find them at Albertsons. I've tried Entenmann’s Little Bites before and really enjoyed them. I would purchase them at Woodmans or Walmart. I have tried a few varieties of Entenmann’s Little Bites. I buy them at Acme. My family loves them! I get them at Walmart and Publix! I have not tried these yet but I want to. I would be able to pick them up at my local Walmart store. We enjoy the Little Bites. We get them from Shoprite. We have tried almost all of the Little Bites flavors and my daughter adores them! Recently we've been buying them at Giant because they are BOGO which has been awesome! I have tried the Little Bites, we love them, would get at Walmart. Yes our family loves the Little Bites Party Cakes and the Strawberry Cakes. I purchase these at our local Wal-Mart. I buy Little Bites a lot. Our favorite is the chocolate chip muffins. I find them at WalMart and at Price Chopper. Yes I have tried them and love them. I stock up at bi-lo when they are on sale. I have tried the Entenmanns and we love them. I shop for them at Kroger. Yes, my family and I love them. We buy them at Publix here in Florida. yes, I tried, I shop for them at Kroger. I have; I get them at the local Walmart. Never tried Little Bites, and am going to my local Von's market to see if they keep 'em in stock. Yes I have I would get them at Meijers. I would buy them at Food Lion and yes, I have tried them years ago. I have, we get them at Giant Eagle. I would shop at Meijer for my favorite mini blueberry muffins. I have not tried them. I would get them when I shop at Marc's. I have tried them and I would purchase them at Walmart. The twins eat these muffins all the time in their lunch. We typically buy them at Sams Club. 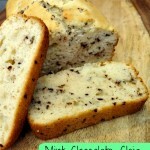 These are really good and everyone in our family enjoys them from time to time. We normally do our grocery shopping at Price Chopper. I have not tried Little Bites, although I recently purchased some for my grandsons at Walmart. 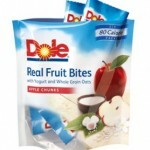 I have had the chocolate chip ones and they are really good!! Thank you for the giveaway! Oh Yes indeed! All their snack cakes are delicious, the only ones I don't eat are the blueberry, and that's only because I'm allergic. We buy them at Walmart. I haven't tried them. I usually shop at Walmart. I have not tried them, but I have seen them at several of our local stores. Walmart supercenter included. I have tried Entenmann's Little Bites. In my area, I purchase them at Dillon's. I have never tried them, but would love to. i shop most at giant eagle. 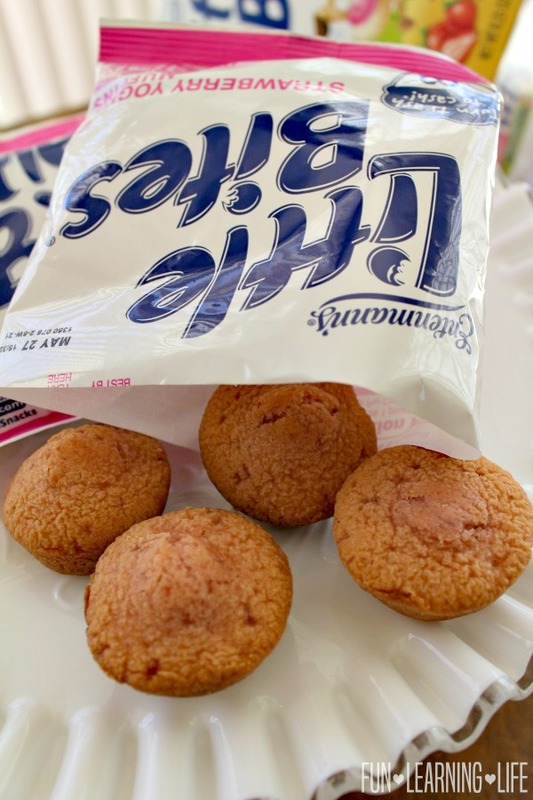 Haven't tried Entenmann's Little Bites, but I would love to try the Crumb Cakes. I would probably purchase them at Family Dollar. I have tried them and love them LOTS. I buy them at Safeway! Yes we are big fans. I get them at Food Lion. Yes I have tried them. I buy them at Albertsons. We haven't tried them. We would shop for them at Kroger. Yes, I have tried little bites before. I would purchase them at Target. I love the chocolate chip ones. I used to eat them every day in my lunch. I usually buy mine from Walmart. i love the little bites. i get them at publix. they are my favorite. I've tried the brownie Lil Bites before, and I really like them. I enjoy poppable treats like that. Love Entenmann’s , would like to try the strawberry bites. I like their blueberry ones. I get them at my King Soopers. Thanks for the contest. Yes, I've tried them. I'd buy them at Publix. I have tried the Entenmann's Little bites. I would get these at Walmart. I like the Blueberry Muffin Little Bites. I have tried Little Bites. Yum! They are available at Publix in my area. Chocolate Chip Muffins would be my choice! I have tried tried Entenmann’s® Little Bites. My family loves the blueberry ones the most. We shop at Albertsons in our area for these products. I haven't tried them. I would buy them at kroger. I'll look for them next time I go. I like the chocolate chip lil bites, I usually get them at Kroger. Yes, my girls love them. We get them at Hy-Vee. I have tried little bites before. We like the blueberry muffins we get them at Walmart. I like the blueberry muffins. I like to buy them when they are BOGO at Publix. I don't think I've tried but I'd get at Walmart! I enjoy the blueberry muffin bites. Our family shops at Publix. I love the Blueberry Entenmann’s® Little Bites®. I usually get them at Harris Teeter or Walmart. We love them! We can get them at our local walmart. Our families favorite is the blueberry. I have tried them. I would get them at Walmart. Yes we had the blueberry ones over the weekend. Bought at Walmart! I have tried a couple of varieties of Entenmann's Lil'Bites, and would shop for them at Reasor's, which is a local chain grocery. I've tried the little bites and I love them. I tried the blueberry little bites and they are delicious! I bought them at Kroger. Yes I have and would get them at walmart. My daughter eats these all the time...we get them at Walmart. I have tried them and I usually get them at Walmart. We love these. We have two boxes in the cabinet right now. We love blueberry! I buy them from Walmart, the only grocery store we have for 45 minutes. Yes, and we love the brownie ones- we buy them at Safeway. Thanks for the giveaway. I would get them at my Walmart store. I have tried so many of them. So good and I go to Walmart or Public. I think we've tried them all, they're great for on the go. I purchase them at ShopRite. My boys love them! We get the chocolate chip flavor! I love the Blueberry Entenmann’s Little Bites the most of all of the fine treats. Silly me forgot to state that I would get these fine treats at Walmart. Yes I've tried Entenmann’s® Little Bites, such as chocolate chip and blueberry. I normally get it at Harris Teeter. Yes, we have tried them. I would pick them up at Ingles or Walmart. We have tried Entenmann’s Little Bites; purchased at Fry's (Kroger). We have tried it and like it. We get it at Giant. I haven't yet, but I'm pretty sure the Safeway I shop at would have them so I'll keep an eye out next time! They look yummy! These look mighty tasty, I love muffins and white chocolate is good on anything at all.